The exhibit hall opened up today at BEA 2013, and I've spent the morning on the floor meeting people, playing with gadgets, and so on. As the day wore on I decided to stop wandering around and make a tour of all the key booths, and that is when I noticed something interesting. Barnes & Noble doesn't have a booth at BEA 2013, and they're not even listed under their other name, Nook Media. But both Samsung and Sony have booths. From what I can tell, B&N hasn't had a booth at BEA in either of the last 2 years, so their absence this year is not all that unusual. But I was reminded of their absence when visiting the booths of Sony and Samsung. 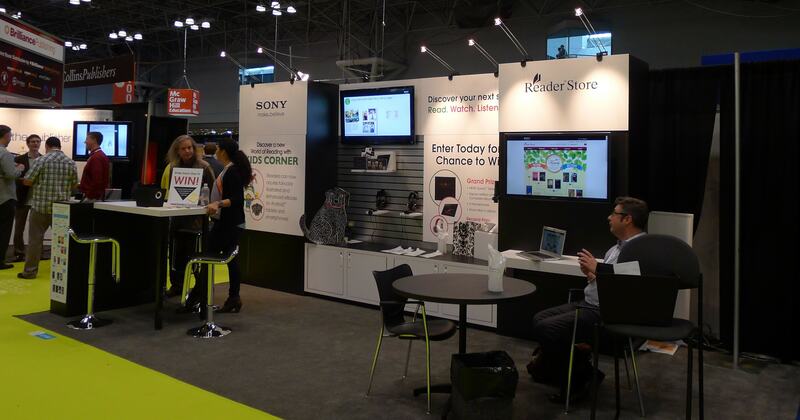 It seems that Samsung and Sony are deeply interested in ebooks. I already knew that from the Epub3 supported reading apps they had each released over the past year, but this point was driven home by the well-staffed booths. They each had large booths in the digital zone and they were happy to show off their latest hardware. And that brings me to why they are here. For some time now I have been wondering why these two tech giants are bothering with ebooks. It's not a terribly large market, but they have each invested in staying on the cutting edge. Given that the return likely wouldn't justify the investment, I didn't see the reason for the continued interest. But now I do. Based on what I was told I think that Samsung and Sony are into ebooks for the same reason that Apple is into ebooks. It's not about the content for its own sake; it's about the hardware the content is consumed on. All 3 of these tech giants makes smartphones and tablets, and their ebook efforts are part of a general effort at tapping into the content markets that exist on their hardware. Basically they see Amazon making money from apps running on their hardware and they want a cut of the action. I believe at least one of my reader suggested this as a possibility some time back, but it wasn't until I spoke to the reps myself that I really understood it. And now that I do understand it I also realize that this is going to have an effect on the ebook market. Samsung and Sony (and Apple, for that matter) aren't investing in ebooks to make money in ebooks, so even if they don't make much money they won't be going away. They'll still be investing in ebooks even if they are merely breaking even, and that means that you can't write them off just because Samsung and Sony only make up a negligible share of the market. If nothing else, Samsung and Sony are hungrier than Nook Media, and they also have a potential install base of millions of devices. That, and hype, was all Apple had going for it when iBooks was launched and look where Apple is now. Why would B&N have a Nook booth when we all know that the company is going downhill quickly. The Nook is being dumped so they are not going to advertise it. Speaking of advertising I don’t see Nook being advertised anywhere or even being talked about when selling books. On TV I always hear authors talk about buying their books on Amazon but never on Nook. No wonder B&N is dying and rather quickly. I mention Nook Media to contrast who gives a damn and who doesn’t. B&N doesn’t. Samsung develop and release eink readers a couple years back; they just pulled back when the ereader hardware became a cost-plus on-ramp for content. Now? 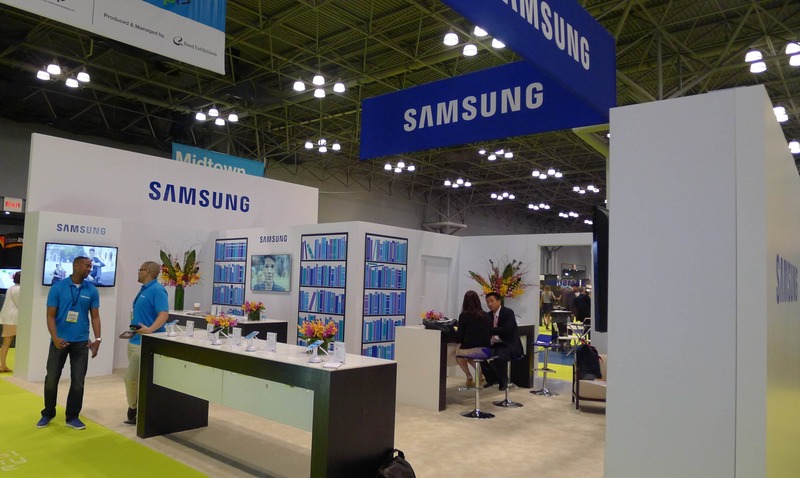 Well, maybe Samsung will buy Nook media. It would give them instant credibility and market share. I don’t think it was Agency Pricing that fudged up Samsung’s ereader efforts and the ebook store that went with it. I would blame the Kindle Nook price war for that. And what triggered the four hour price war but the arrival of agency pricing? Agency pricing may have enabled the price war but it didn’t trigger it. The trigger was B&N thinking it was a good idea to try to undercut Amazon prices. Presumably they wanted to squeeze everybody else out cause I can’t imagine they thought Amazon wouldn’t match and beat their bid. The “price war” was caused by Borders launching the first Kobo reader at $199 to try and undercut BN/Amazon, and the other two following suit. I don’t see Samsung moving into content. They must see that’s a tough space and they don’t bring anything unique to the party. Nook Media’s assets aren’t abuot hardware, it’s about the content store and content platform — so a fit with Samsung is poor. Note that Kobo was not bought by a hardware company but by an online retailer. Apple, first to the party, should a hardware company could get into content with iTunes and, while the platform has been a success, it does not drive profits at Apple .. it helps drive sales of Apple hardware. Amazon came at this other way: it started with physical content, got into digital content (after Apple) and flourished in ebooks. It’s road to being a force in music and video has been a long one. It may find itself succeeding only after adding hardware. Samsung has a fairly poor (short) history with digital content: it’s app store and Smart TV platform are footnotes for both the company and consumers. Lots of potential: but Samsung’s Smart TVs will not flourish till they dump their proprietary system and embrace Android. So whether it’s for the content or the hardware, Nook Media doesn’t really bring Samsung components it wants to leverage. Sony is the amazing miss here. It was a leader in the ebooks and ereaders at one time, including with some international distribution, and the best recognised brand. It has shown no ability to leverage its own assets to win in the space; it’s future still feels bleak. Even in console gaming they’re talking contrarian: at a time the market for dedicted gaming devices looks to be tightening under pressure from multifunction devices they claim to be focused only on gaming fans. If nothing else they make for amusing spectacle. Sony frequently does the exact opposite of everyone else for a reason. They are bg enough to survive major failures. When the electronics manufacturers move into a new field, generally most companies will agree on an industry standard for comparability. Sony will then make their own proprietary version and try to grab the market. They usually fail (Betamax, Memory Stick), but when they succeed (Blu-Ray), they can make enough to make up for a dozen failures.